Right now the UK is being bathed in glorious sunshine (oh the humidity! ), any attempt to do anything in this sweltering heat makes me irritable and unpleasant. If I’m sassing about in my swimsuit with a gin and tonic then the sun is bearable. Unfortunately I actually have to get things done, so to avoid being a complete (cranky) mess I try to keep things simple. Aside from keeping a bottle of Caudalie Beauty Elixir in my bag at all times (an absolute life saver when the sun has tried its best to burn off your face) I like to keep make-up minimal, fresh, and light. Soft, matte neutrals lined with a little brown shadow or pencil. Nothing out of the ordinary there except I go extra light on the liner and only a single coat of mascara. The eye brows sometimes get left to do their own thing otherwise it's a quick fill-in with shadow, held in place with a little Homeoplasmine. Remember: nothing too heavy or it'll all start melting off. Nobody needs the added hassle of reapplying lipstick to chapped lips when the sun has dried it all up. Keep things simple by using a moisturising balm with or without a hint of colour, just make sure it’s super easy to reapply and doesn’t require a mirror. My Lily Lolo mineral foundation doesn't budge in the heat and lasts all day, so I stick with it come rain or shine (what isn't broken doesn't need to be fixed, right?). I like a matte finish and using a highlighter adds a gorgeous glow requiring little effort. Seriously, sweep a ton of that stuff all over your face and everyone will think you're glowing instead of sweltering. 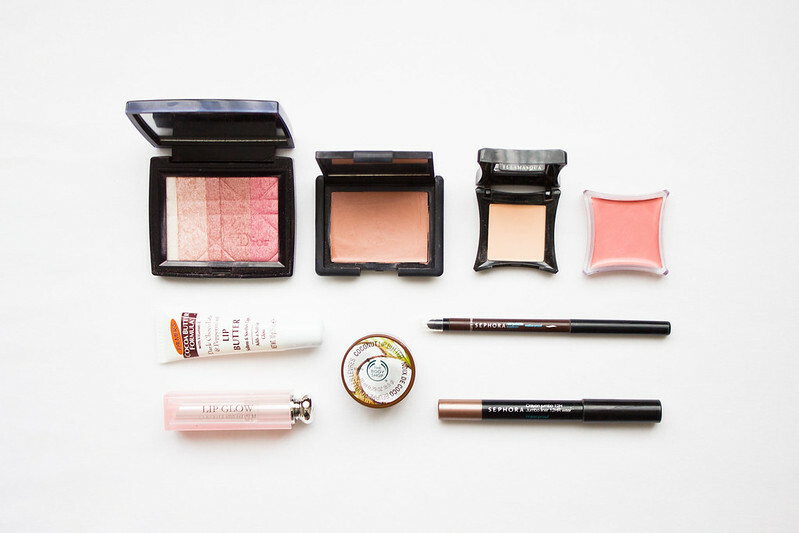 Add a tiny hint of natural flush with a soft pink blusher and you're done. What do you do when the sun makes make-up unbearable? Buy the Christian Dior one, it's SO UNBELIEVABLY GOOD. Can I just say that you sounds so lovely - as deduced from your photos and posts. Invite for tea, one time? This post has made me rethink my everyday makeup. Oh totally - I'm always up for tea. Your photography is always so beautiful. I need to take some NOTES! I just started with my own camera. Do you care on making a post about lighting and how you take posts? I hadn't thought about it but if that's something people would like read about then I'd be more than happy to do a post. HA. Yeah, I'm a sucker for pretty looking make-up. I wish I'd had those products when I was melting in York today! My sun regime is similar - BB cream, a bit of cream blush, filled and waxed brows and a smudge of eyeliner. The sun makes us all lazy, right? Why bother if it's all going to melt off.